Wards® UV/VIS Spectrophotometer is the perfect solution for your classroom or laboratory when ultraviolet and visible analysis is a must! Built-in software offers wavelength scanning, as well as a large 4-line LCD display that can be read from any angle. The touch buttons make commanding easy and data entry quick and convenient. 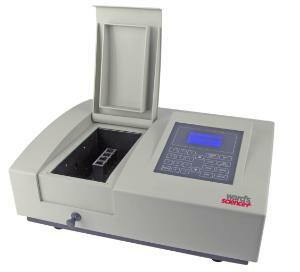 The menu is task driven and makes your spectrophotometer very user-friendly. A large on-board memory is capable of storing 200 test methods (standard curves) and saving up to 500 test data. Each unit comes standard with both USB and RS-232 data ports for communication. Two optional features make documentation and reporting a snap; optional software for PCs which includes scanning capability. The USB port can be used for both data transfer and software upgrades. The optional Windows® XP based software expands the capabilities of the instrument including Standard Cuvettes, Kinetics, Abs. & %T, DNA/Protein ratio and wavelength scanning. Data can be easily exported to Excel® for further processing, analysis and storage. Ordering information: The 2150 comes standard with an operation manual, dust cover, a set of two 10 mm UV Transparent Quartz cuvettes and a set of four 10 mm square optical glass cuvettes.